You want an alien world created anew, with wonders and horrors lurking in its furrows? You go to Ridley Scott, of course, spectacle maker and pictorialist par excellence. So Prometheus is bound to be eye filling, with fully wrought planetary vistas and occasionally jaw-dropping visual coups. And did we use the word alien back there? Yes, folks, Prometheus is a prequel, in a sideways sort of fashion, to Scott's 1979 Alien original--or at least it's a long-distant stage setter for that story. This one begins with a space mission that could reveal the extraterrestrial roots of Earth, although what's buried out on the planet turns out to be much more complicated than expected. In the midst of suspenseful episodes (and a few contrived plot turns), Prometheus reaches for Big Answers to Big Questions, in a grand old sci-fi tradition. This lends the movie a hint of metaphysical energy, even if Scott's reach extends well, well beyond his grasp. The hokier moments are carried off with brio by Michael Fassbender (the robot on board), Charlize Theron, and Idris Elba, and then you've got Noomi Rapace entering the badass hall of fame for a long, oh-no-they-didn't sequence involving radical surgery, which might just induce the vapors in a few viewers. Even if Prometheus has its holes, the sheer size of the thing is exciting to be around. Because this movie is gigantic. --Robert Horton. 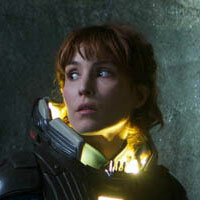 Noomi Rapace as Elizabeth Shaw captured the eyes of the international entertainment community with her commanding, unnerving and critically acclaimed portrayal of Lisbeth Salander in the film adaptations of Stieg Larsson's Millennium Trilogy: The Girl With the Dragon Tattoo, The Girl Who Played With Fire, and The Girl Who Kicked The Hornet's Nest. Rapace began her acting career at the age of seven, in Iceland's In the Shadow of the Raven. She has since gone to appear in over twenty films and television shows. Born in Sweden, Rapace is the daughter of Flamenco singer Rogelio Duran. Shaw, an archaeologist, discovers a clue to the origins of mankind on Earth, leading her and a team of scientists and explorers on a thrilling journey, aboard the spaceship Prometheus, to the darkest corners of the universe. There, they must fight a terrifying battle to save the future of the human race. Shaw and her team aboard the Prometheus are on nothing less than a journey to discover answers to some of life’s most profound questions. She is a scientist filled with faith and hope, but who transforms into a warrior when faced with the danger she encounters at her destination. Michael Fassbender as David enjoyed a phenomenal run of critically acclaimed performances in 2011 and 2012, garnering numerous accolades and awards. The National Board of Review awarded Fassbender the Spotlight Award, and the Los Angeles Film Critics Association named him Best Actor for his performances in Shame and Davide Cronenberg’s drama A Dangerous Method, in which Fassbender plays Carl Jung opposite Keira Knightley and Viggo Mortensen. Fassbender was also recently seen in Matthew Vaughn’s X-Men: First Class, as Erik Lehnsherr, better known as super-villain Magneto; as Rochester in Cary Joji Fukunaga’s Jane Eyre; and as an assassin opposite Ewan McGregor and Gina Carano in Steven Soderbergh’s Haywire. 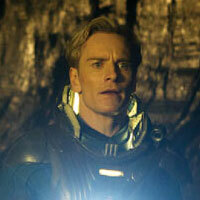 Fassbender is a graduate of London's prestigious Drama Centre. His breakthrough role came as Sgt. Burton "Pat" Christenson in HBO's epic, award-winning miniseries Band of Brothers. David is an android creation of Weyland Industries. While David possesses extraordinary intelligence and other capabilities, his principal tasks aboard the Prometheus are servile. David is however far more “human” than one might expect of a synthetic person. He is jealous and arrogant because he realizes that his knowledge is all-encompassing and therefore he is superior to the human crew members. David’s allegiances are unclear, and he can be very bold in the decisions he makes. Charlize Theron as Meredith Vickers demands the audience’s full attention as soon as she appears on screen. This South African captivated audiences as female serial killer Aileen Wuornos in the independent gem Monster. Charlize’s feature film debut was MGM’s 2 Days in the Valley, with Jeff Daniels. In 2001, Theron starred in the Warner Bros. tearjerker Sweet November alongside Keanu Reeves, as well as in Woody Allen’s Curse of the Jade Scorpion. In 2002 Theron starred opposite Patrick Swayze and Billy Bob Thornton in Waking Up in Reno, and opposite Kevin Bacon, Courtney Love, and Dakota Fanning in the feature film Trapped, directed by Luis Mandoki. Vickers is a “suit” representing the interests of the mega-corporation funding the Prometheus’ journey to a distant, foreboding world. Her perspective on the mission is at odds with the rest of the crew’s. For Vickers, this epic, two-year journey to a distant planet has been boiled down to economics. But as with so much else about the mission, there are deeper layers and mysteries to Vickers’ ultimate goals. 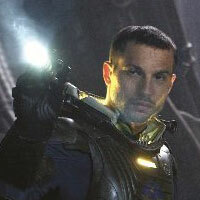 Logan Marshall-Green as Charlie Holloway ) appeared on the big screen in Devil, produced by M. Night Shyamalan. He is best-known to film audiences for playing radical activist Paco in Julie Taymor’s Across the Universe. He has also co-starred in the films Brooklyn’s Finest, The Kindness of Strangers and The Great Raid. A graduate of New York University’s Tisch Graduate Acting Program and a prolific stage actor, Marshall-Green earned a Drama League nomination for his work in King Lear with Kevin Klein at the Public Theatre, and Greg Kotis' Pig Farm at the Roundabout Theatre off-Broadway. He earned Lortel Award nominations for his performances in Dog Sees God and Neil LaBute's The Distance from Here, the latter also earning him a Drama Desk Ensemble Award. Holloway is Shaw’s partner, both personally and professionally, in a quest for answers to some of humanity’s most important questions. Like Shaw, Holloway is a scientist with a thirst for answers, but he thinks the end of their search will yield very different results from those Shaw expects. While Shaw is the heart of the search, Holloway is its guts. He is constantly pushing the envelope, going to the extreme in everything he does. He is driven by the thrill of the quest.